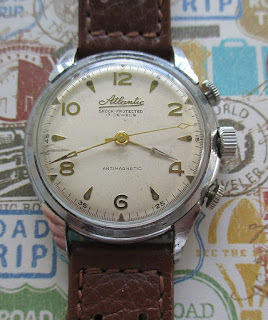 Bruce's Vintage Watches : Atlantic "Stop Chronograph" Fun at a Fraction of the Price of an Omega "Chronostop"
I've long maintained that there a TON of watches out there that are unusual, interesting, even rare, that don't cost a lot of money. You don't have to break into the 401(K) fund to have some fun in this hobby. Take for example this Atlantic stop timer chronograph. It sort of looks like a chronograph, but without the registers. The top and bottom buttons merely freeze the sweep second hand (top button) and reset the sweep second back to zero (bottom button) whereupon it resumes its sweep as a normal second hand. The freezing of the second hand is a little different from a "hack" feature found on some sport and military watches in that it does not stop the whole movement. In other words, the watch keeps on keeping time, even when the top button is depressed. 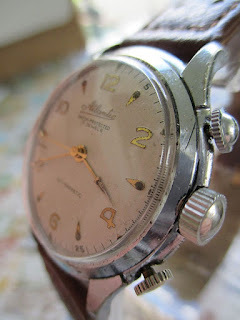 In this way, the watch does not lose time when the stop feature is being utilized. The Atlantic stop timer chronograph utilizes the ETA Caliber 1168 movement. The direct sweep second is continuously running, and is coupled to the fourth wheel with a latching axial clutch. The pusher at the 2:00 position stops the second hand as long as held down. The pusher at 4:00 resets the second to zero, and restarts it when released. 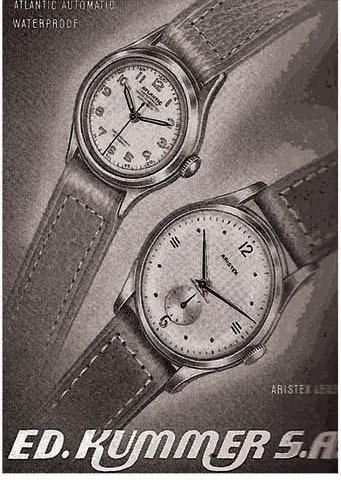 Several companies used this movement, including Breitling, and promoted the watch to physicians, time/motion study scientists, technicians, photography darkroom enthusiasts, etc., just about anyone needing a watch to measure short bursts of elapsed time, while maintaining constant time like a "normal" wristwatch. 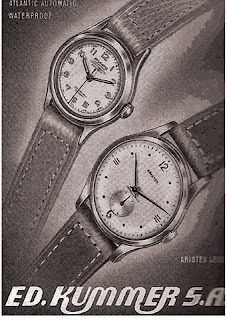 Perhaps most famously, the Omega Watch Co. utilized this concept on their "Chronostop" model, although their movement is based on a Lemania ebauche. 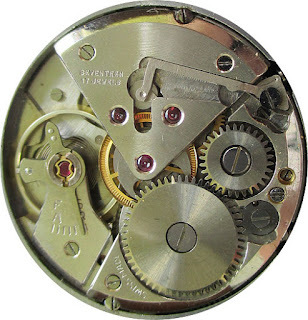 It's labeled "Wall" watch company, but the movement is the same as inside the Atlantic. In any event, it appears that Atlantic did not have great success with this model, due to its limited timing ability. I'm not even aware that Atlantic gave it a specific model name. I hate to reveal the exact price I paid for it, but let's just say it was under a hundred bucks. I want to play with the watch for a while, but eventually it will be for sale on my website! Thanks for reading, and I hope you encounter some unusual "finds" in your travels as well!